I'm beginning a monthly interview series in which I interview (either face-to-face or by phone) people who have something fresh to say. Because Jelly Theory is an idea-driven blog, I thought it would be nice to share the conversations I have with people I consider to be idea-oriented. This is my way of allowing this site to be a space where today's ideas can be freely exchanged and discussed in a real, personal way. I'm very pleased to present to you the first in my interview series, Amit Gupta. Amit is a 20-something entrepreneur in San Francisco who started Jelly, a global casual coworking network, with his friend Luke Crawford in Manhattan in 2006. He is currently working on Photojojo, a biweekly email newsletter filled with photography tips and ideas. Here’s the deal: Luke and Amit both love working from home, but they find that spending the occasional day working with others really helps get the creative juices flowing. Even though everyone’s working on their own projects, they can bounce ideas and problems off of each other and have fun doing it. What’s Jelly? Jelly’s our attempt to formalize this weekly work-together. We invite you to come work at our home. You bring your laptop and some work, and we’ll provide wifi, a chair, and hopefully some smart people. Can you give a brief history of coworking? How is Jelly's version of casual coworking different? Coworking has existed for quite a while, especially among journalists and writers in New York who have a freelance lifestyle. Now the trend is moving to tech. In the past few years, people in tech have flexibility to work anywhere, but they lack a sense of community and structure. The Coworking Wiki will give you a more thorough history. Jelly is different from the traditional concept of coworking, which addresses the need for physical work space (e.g., renting desks). With Jelly, the motive is different because it addresses the need for human interaction rather than physical space. The primary activity is to share. We were working at the kitchen table, and there were jelly beans beside us. We wanted a fun name. When you first started Jelly with Luke, how did you spread the word? We began by inviting friends to work with us at our kitchen table. While we worked on our own individual projects, we also shared ideas, and discussed problems and potential solutions, and word got around. Friends began raving about it. People wanted to start their own Jellies, and Jelly spread firely. We also got a lot of press from Wired, NPR, Today Show, etc. How many people usually attend a Jelly? How often do Jellies meet? It depends. In San Francisco, Jellies happens once a month with 20 to 25 people showing up. We rotate among three different apartments. Do people who attend Jellies come in groups or by themselves? By themselves, mostly, but they may know people who are attending. Careers represented? San Francisco is very tech focused. We have developers, designers, bloggers, and journalists attending. New York is less skewed. Different cities are skewed in other directions. What personality type does Jelly draw? People who are comfortable around other people and obviously not super shy. Safety concerns? So far it hasn't been an issue. The ethos of the event and the language on our site select a particular kind of person who is trustworthy. How has Jelly grown since 2006? Jellies exist in the US, Australia, Europe, and Canada, and are getting started in Africa, China, India, and the Philippines. (See a complete list.) It's tough to say how many people are in the Jelly network, but I'd guess in the low 100s. You can also start your own Jelly through our wiki, which provides organizers with a guide to getting started. Each Jelly has its own culture, depending on the local climate. For example, in New York and San Francisco, Jellies are mainly held in apartments; while in Austin and Chicago, they are more often held in coffee shops. I don't get surprised anymore. There's a universal human need to connect to other people. People go looking for something to get back that sense of community. Can you tell a story that happened at a Jelly? I'll tell you about an interesting person I met at a Jelly, and I wouldn't have met him otherwise. Joey Roth is an industrial designer who moved to San Francisco from New York and comes to the Jellies in San Francisco. He designs beautiful glass and steal teapots. He's a one-man company, both in designing and manufacturing. In my own social and work life, I'm usually interacting with people in the tech industry, but I still get to see a window into product design. What are critical success factors for Jellies? The key ingredient is to have a great organizer. Somebody who really wants Jelly to work and organizes consistently. The personal need for Jellies to exist is the most important part. I saw that Jelly Talks are getting started. How are they going? Our first two Jelly Talks went great. Both were well attended with a dozen Jellies represented in each one, and tons of streams around the country and globe. The first one was on on Facebook Connect and Open ID (January 30), and the second one was on tips for entrepreneurs (February 13). Our vision for Jelly Talks is to bring together the disjointed Jellies around the world. Where is Jelly headed, in its long-term vision and business model, if any? There's no institution behind Jelly, it's not incorporated. We created it as a project, not to make profits, but because it was personally useful to us and our friends, and that's just fine. It doesn't cost much to run Jelly, and we have generous sponsors who support us. The model is to let the community drive what Jelly will become. If the Jelly community is still interested, we'll keep growing it. An entrepreneur is someone who writes his/her own destiny. You're in control of your life, what you want to work on, and who you want to work with. On a related note, in the past month, I've been pleasantly surprised by the enthusiastic responses I've been getting from the people I've been reaching out to. It goes to show that conversation is a natural thing after all. Note: This is a blog post I wrote for Wokai. Wokai is a website that allows you to lend money to the poor in China. You can also find this post on the Wokai Adventures blog. The above email debate between Ashoka’s Al Hammond and University of Michigan’s Aneel Karnani was posted (with permission) on Next Billion’s blog last Thursday. Their exchange was sparked by an article that Karnani wrote back in December. The article, “Romanticizing the Poor,” was published in the Stanford Social Innovation Review, and it was provocative. Change needs to come from the bottom level. The quest for growth in poor countries has been long and elusive. In his book The Elusive Quest for Growth, William Easterly shows that in the past 50 years, foreign aid, capital investments (both in machines and humans), population control, policy reforms, and debt forgiveness aren’t the answers when it comes to explaining growth. When Easterly spoke at Stanford last spring, he concluded his talk by admitting that experts can only do so much to understand and promote growth. Instead he focused on the individual, specifically on the idea of the creative individual and individual responsibility. Entrepreneurship isn’t classy. I agree with Karnani in that governments need to stay involved in the welfare of the poor by investing in infrastructure and reforming policies, but we’ve seen that neither government investments, nor policy reforms are the elixir to sustained growth and improved lives. Before we dismiss the poor as incapable of an entrepreneurial life, we need to consider for a moment that entrepreneurship isn’t just for the elite. Sure, poor people with cool ideas may not have access to the training, resources, and funding that their wealthier counterparts have, but all that can come with time and experience, while the vision of those ideas can never be taught. Not all MNCs exploit. It’s suspicious that the only examples Karnani refers to in his article are MNCs in the tobacco, alcohol, and consumer products industries. What about, technology? Cell phones have penetrated developing-country markets at rapid rates, leading to interesting and beneficial services that run off the mobile platform, including mobile education (mEducation), mBanking, and mHealth. In the nascent field of mHealth, for example, the cell phone is quickly proving to be an efficient means of healthcare delivery in areas where health infrastructure is severely lacking. The introduction of mobile phones in the developing world means greater connectivity, which means more access to information and heightened transparency. The case study of fishermen in Kerala is a compelling one. (The illustration at the very top is by Belle Mellor and was used for The Economist's article "The meek shall inherit the web.") When healthy incentives align all players in the value chain, and value is delivered to each player – MNCs, governments, nongovernmental organizations, and the poor people themselves – you can’t call that exploitation anymore. Everyone has the right to invent and innovate, and to make decisions to buy things without judgment, and if you can free yourself from a life of poverty in doing so, that’s a beautiful thing. “Freedom is just another word for entrepreneurship.” I believe in that. 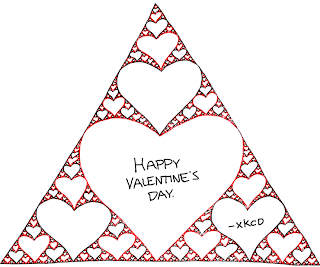 I found this "Sierpinski Valentine" on xkcd, a witty math webcomic. Where romance and mathematics meet...fractal style. Happy Valentine's Day. Elizabeth Gilbert, author of Eat, Pray, Love, speaks at TED2009 (last week) about the creative process and how artists are culturally conditioned to be afraid of it. Watch this. "And then the Renaissance came and everything changed and we had this big idea and the big idea was let's put the individual human being at the center of the universe, right?...People started to believe that creativity came completely from the self. And for the first time in history, you start to hear people referring to this or that artist as being a genius rather than having a genius. And I got to tell you I think that was a huge error." I sometimes tell my sister that my friend so-and-so is a genius, and every time she rolls her eyes and informs me that I think everyone is a genius. She is the one person who has expressed such a strong aversion to the term genius, and I'm beginning to see her point. A seasoned entrepreneur shared with me that his philosophy is to fail fast and fail often. He's not an artist per say, but what is it about his (entrepreneurial) spirit that seems to embrace failure as a platform for arriving at genius-inspired success? To paraphrase the end of Gilbert's talk, you don't have to believe that any greatness you bring to the world comes from just you; don't be afraid or daunted -- just do your job with human love and stubbornness. Last night I attended a tech talk by Marissa Mayer, VP of Search Products and User Experience at Google (and Google's first woman engineer!). The event was organized by Stanford IEEE. What I walked away with? A slice of pizza and the provocative statement that, "Search is dumb," the title of Mayer's talk. What's it called again when you assign human traits to objects...personification? I often feel that the world's information is at my fingertips, so it's hard for me to completely get it when I'm told that only a small fraction of search (not even 10 percent) has been solved, that the most interesting stuff in search is still to come, and that, as Mayer put it, search is like a three year old child. Here's why. Search doesn't understand you. For example, when you search "nice cafe," it doesn't know what you mean by "nice" (a value judgment), and when you search "jaguar," do you mean the animal or the car (type differentiation)? Search doesn't understand the context you bring to your searches, i.e. it doesn't understand user intent. This is the next big challenge in Computer Science -- the journey to engineer the perfect search engine. In a world of perfect search, each search you do would be returned with a perfect answer that takes into account context and intentions...and it'd conveniently be in the right media form (maps, images, videos, web pages). 1) Unmanageable/unmonitored growth: Every minute, 15 hours of video content is uploaded to YouTube. Every day, 120,000 new blogs are created. 2) Anonymity/lack of responsibility: 60 percent of bloggers don't list their full first names. 31 percent of users on social networking sites lie about their identities. a) If Google is really heading toward basing its search results off a database of intentions (as opposed to mere indexes), how will Google collect information on user intentions? If it's through analyzing and tracking user clickstreams and inferring intentions based on past trails, then my question is: Are past trends a good indicator of what users want in the future? To a certain degree, I believe that users don't always know what they want or what's best for them and that part of the innovation process involves exposing them to ideas (or in this case search results) that they may never have stumbled upon otherwise.